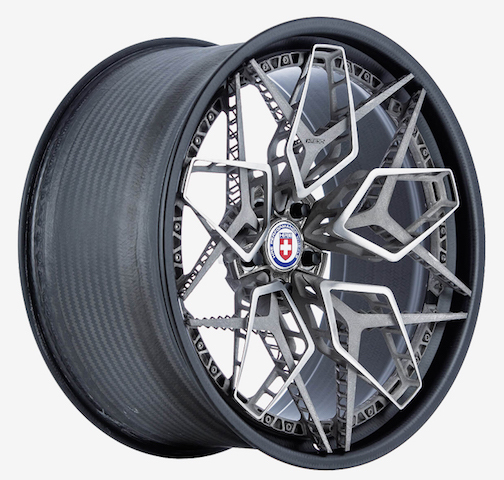 A California company mostly known in the automotive industry for its custom monoblock alloy wheels has teamed with a division of General Electric to produce a world-first 3D-printed wheel from titanium powder. HRE Wheels and GE Additive used Electron Beam Melting (EBM) to create the lightweight prototype wheel, pictured above on a McLaren P1. EBM uses electron beams to melt and fuse layers of titanium powder into a solid, a product that would be impossible to create with electro-mechanical CNC machining. “This is an incredibly exciting and important project for us as we get a glimpse into what the future of wheel design holds,” said HRE Wheels president Alan Peltier. A standard alloy wheel from HRE Wheels starts out as a forged block of aluminium before the CNC tools shave off 80 per cent of its bulk. But EBM requires only five per cent of the metal to be removed after printing. The excess titanium powder is recycled. The 3D+ titanium wheels are made of five individual pieces, with a custom centre section and a carbon-fibre rim. Titanium fasteners hold these layered spokes together, with the completed wheel looking like nothing on the market today.